The SRAM Force chainsets are for serious road riders, benefitting from a range of weight saving technology based on carbon components. Force crankset weighs in at 665g - A 6K Carbon weave yields a one-piece design that is lighter and stiffer than traditional cranks - Hard-anodized PowerGlide chainrings for long-lasting performance - Includes GXP Team BB cups - Radial loads are transferred to the GXP drive-side bearing - optimizing bearing loading and power transfer while minimizing wear - 10 Speed - 50/34. 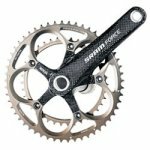 For example the SRAM GXP Chainset is an all-carbon construction with carbon arms built on an aluminum spline, along with a carbon spider to further reduce weight.